Samsung Galaxy M30 review: Can good display, big battery save the day? The Samsung Galaxy M30 is launched in India. The device sports a 6.4-inch Super AMOLED Infinity-U display and offers a 2340 x 1080 resolution and 19.5:9 aspect ratio. Under the hood, it is powered by an octa-core Exynos 7904 chipset backed by Mali-G71 MP2 GPU, 4/6 GB RAM and 64/128 GB default memory capacity. This storage is expandable up to 512GB. It has a triple camera setup which comprises a 13MP main sensor (f/1.9 aperture), 5MP depth sensor (f/2.2 aperture), and a 5MP ultra-wide angle (f/2.2 aperture). For selfies, it has 16MP. Connectivity options on board the Galaxy M30 include Wi-Fi 802.11 a/b/g/n, dual-band, WiFi Direct, hotspot, v5.0, micro USB 2.0, with A-GPS, GLONASS, and dual Sim. The handset is fitted with a massive 5000 mAh battery that comes with fast charging support and runs Android 8.1(Oreo) out of the box. Sensors include a fingerprint, an accelerometer, gyro, proximity, and compass. The smartphone is available in Blue and Black color options. The Samsung Galaxy M30 price starts from Rs. 17,989. Samsung Galaxy M30 with triple rear cameras and 5000mAh battery sale at 12 PM in India. The 4GB RAM variant carries a price tag of Rs 14,990 and the 6GB RAM variant is priced at Rs 17,990. Now, according to a new leak, the company is working on a new M series smartphone, aka, the Samsung Galaxy M40, which is expected to offer better specs and features, compared to the Samsung Galaxy M30. Samsung Galaxy M30 with triple rear cameras flash sale at 12PM, price starts at Rs 14,990. The Samsung Galaxy M30 will be available on sale via flash sale on the e-commerce platform Amazon. The device can also be grabbed via Samsung's online store. 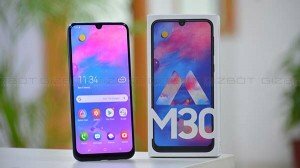 Samsung Galaxy M30 going up for sale again in India tomorrow. The smartphone's key highlight is the triple lens rear camera setup comprising of a 13MP (f/1.9) primary lens paired with a 5MP (f/2.2) secondary sensor and one 5MP depth sensor.